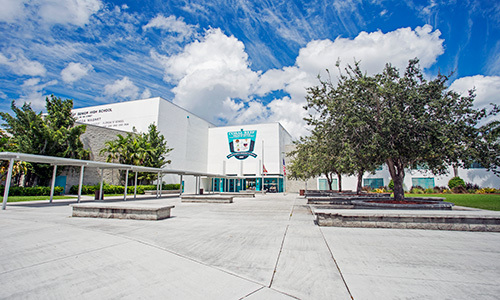 What does it mean to be a student at Coral Reef Senior High School? You are attending a school that has demonstrated excellence consistently and, as a result, has repeatedly been designated an "A" school by the State of Florida. You are a member of one of six magnets, each a unique program in Miami-Dade County, yet you embrace the honor of being a citizen of 'Cuda' Country. You are a thoughtful, considerate, and capable young woman or man who has accepted the challenge of becoming or continuing the tradition of excellence and achievement that has been established by those who are our graduates and by their awards, honors, and distinctions too numerous to mention. You are a student who desires a world-class education defined by rigor and critical thinking as well as by mastery of 21st Century technology skills. You are in a School of Excellence which fosters success. It is, then, with high expectations for an exceptional year that I welcome you. It is your good fortune to be a student in the best environment that Miami-Dade County Public Schools has to offer. Each staff member is prepared to aid you in attaining your personal goals and highest level of success. Study diligently, involve yourself in extra-curricular activities, and serve your community. Make this year one of the best and most memorable--a time to cherish always.